Heywood, a rural town, is on the junction of the Henty and Princes Highways, 25 km north of Portland in western Victoria. They Heywood district was travelled in by the New South Wales Surveyor General Thomas Mitchell, during his Australia Felix expedition in 1836. Mitchell named Mount Eckersley (a few kilometres north of Heywood) and the Fitzroy River, which flows south-east through Heywood. Mitchell had made contact with the Henty brothers at Portland, and in 1837 Stephen Henty cut a track to the northern pastoral country described by Mitchell. He established a pastoral station at Mount Eckersley. In 1839 an overland survey party from Melbourne reported on suitable land for grazing and cultivation near the Fitzroy River and remarked on the suitability of the place for a township. Possibly in 1839, or more probably 1841, the Bush Inn was opened at the site of Heywood. It was around this site that the town of Heywood was surveyed in 1852. It is thought that the surveyor named it after Heywood in Lancashire, England. James Bonwick described Heywood in 1856 as having two hotels, a store and a few huts, set in fairly flat landscape. Shortly after Bonwick’s visit, he was a school inspector, Heywood’s first school was opened. Notwithstanding the flatness of the land there was considerable forest for wood cutting around Heywood. Sawmills operated until well into the twentieth century, when pine plantations were established. A pastoral and agricultural society was formed in 1902. Heywood’s progress during the twentieth century was one of almost continuous population increase, halted slightly in the twenty-first century. Notable fillips to growth included creation of a railway junction in 1917 by the line to Mount Gambier, a cheese factory (1929) and a pipe works (1960). During the 1950s and 1960s a consolidated school was opened (1951), along with a hospital (1957), a high school (1962) and a swimming pool (1966). Heywood is a sub-regional centre with a shopping centre, facilities for swimming, golf, tennis and bowls, a community health service, a community centre, a consolidated primary school (148 pupils, 2014) and a secondary college (166 pupils, 2014), Anglican, Catholic, Lutheran, Presbyterian and Uniting churches, a hotel and a caravan park. The Portland railway line carried freight only and services on the Mount Gambier line were suspended in 1995. Local history and curios are to be found in the Bower Bird Museum. 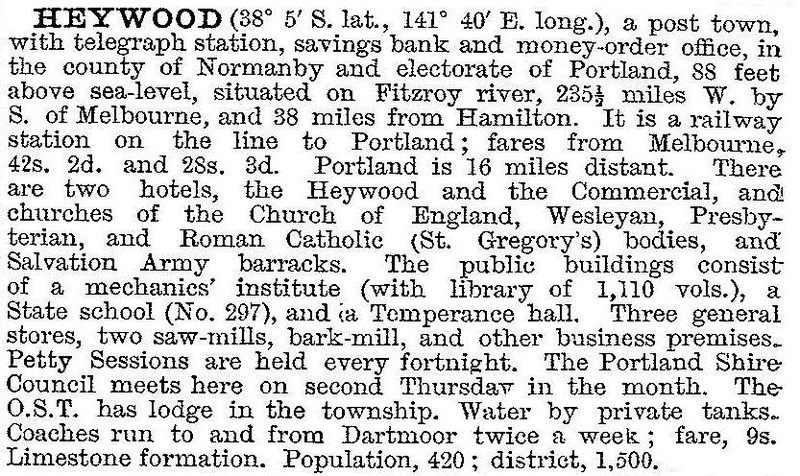 On 1 October 1988 the name of Portland shire was changed to Heywood, which continued until municipal amalgamations in 1995. There are extensive softwood plantations north and east of Heywood, and a pulpwood mill was proposed for Heywood in 2004. Three years later the proposal was abandoned and the mill was promised to Penola, South Australia. A wood pellet mill received planning appoval in Heywood in 2009 but remained in limbo.